This product was added to our database on Tuesday 27 September 2005. 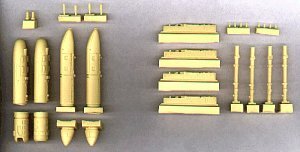 This set contains 2x 9A669 30mm grenade launcher, UPK-23-250 23mm twin Cannon, 4x AT6 Spiral, 4x BDZ-57krV pylons. Also suitable for other Russian Aircraft.